The GE Spectra stove is a freestanding range with QuickClean technology. Although the range comes with a one-year limited warranty, you should follow GE's recommended care instructions for the unit, which include avoiding immersion of the surface units in water, keeping the oven vent clear of obstructions and not cleaning the oven's door gasket. If your GE Spectra stove malfunctions after the warranty period or you wish to avoid waiting on a service call, you may be able to troubleshoot and repair minor issues yourself. Unplug the stove from the electrical outlet, then plug it securely back in if the clock and timer do not work or if the unit does not operate at all. Make sure the outlet works by checking your fuse box or circuit breaker; replace blown fuses or reset tripped breakers. Turn the stove top controls off and allow the electric surface units to cool completely if they do not work as they should. Pull the surface unit from its receptacle, then push it fully into its intended position. 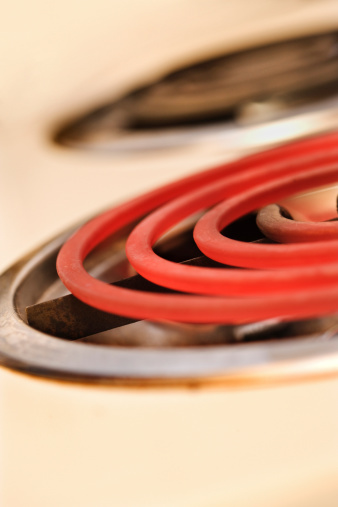 Inspect the drip pan beneath the burner, making sure it fits securely into the stove top's recess. Turn the burner back on, taking care to use the knob associated with that specific burner. Allow the broiling element to heat for at least 10 minutes prior to broiling food, and use a pan specifically intended for broiling if you experience less-than-desirable broiling results. Unplug the Spectra stove and leave it unplugged for at least 30 seconds if an error containing "F," followed by a number or letter, shows on the display. Plug the unit back in and see whether it works properly. If it does not, contact a service technician. If your model has self-cleaning properties, you may also be able to relatch the lock if the error appears during a cleaning cycle. Give the oven one hour to cool, then restart it. Allow the oven time to cool if you wish to set a self-cleaning cycle but the oven is hot. The unit does not allow you to begin a cleaning cycle if the oven is too high. Check the door latch before attempting to set the self-cleaning cycle, as it will not work unless the oven is locked. Push "Clear/Off" if your oven produces much smoke while a cleaning cycle is underway. Allow the smoke to clear the room with the aid of open windows and fans, and wipe the offending spill from the oven once it has cooled completely. Restart the cleaning cycle. Call the installation technician or an electrician if your range's display reads "bAd," then "linE" as a loud tone sounds. This indicates an electrical problem. Push "Bake" and "Hi/Lo" at the same time, holding them for three seconds, if you have trouble making the display show "SF," which is necessary to set the oven's 12-hour shut-off feature.